Let's talk about plywood now that MDF is never going to be used again in your furniture projects. Plywood is made of solid wood strips glued up in width, with two or more veneer layers on both faces (lumber core) or multiple veneer layers with every other layer 90 degrees to the above layer. The layers vary from roughly 1/4" to 1/16" thick and 5 to 15 layers of hard or soft wood with one layer of more or less finished veneer on both faces, depending on the grade (veneer core) The positive attributes of plywood, especially lumber core, and Baltic birch or apple ply (both usually 15 layers of hardwood) are it is relatively light, strong and fasteners, joinery and glue-ups work pretty good. Also, there is not much dimension change with an increase or decrease in humidity. The disadvantages of plywood are the surfaces, and especially the edges, which damage easily. Also, if you want to use solid wood and plywood together, they are difficult to match finishes, because the cut of the veneer produces different grain patterns and solid wood oxidizes differently than veneered surfaces that are only 1/60" to 1/30" thick. Solid woods like cherry and mahogany get quite a bit darker as they age, while walnut becomes lighter, kind of a golden brown. Veneered plywood changes very little, the change being hardly noticeable. My conclusion has been if I am going to use plywood in a project, it is only used on the interior of a project, such as division walls, bottoms, backs, etc. All exterior frames, panels, doors, drawers, including drawer sides and all shelving are solid wood. This combines the strength and ease of working in plywood on the interior parts of the project, and the furability and beauty of solid wood on the exterior and other areas of the project, where wear is a concern. Note: Don't use plywood for any shelving, especially adjustable shelving. Over time, plywood will sag. Solid wood can be repaired and refinished over and over, giving it longivity other materials don't have. One other concern is to be careful when combining solid wood and plywood because of the difference in expansion and contraction, which I will go into more in the future. I know that most of the world is adopting MDF in it's various forms as the accepted standard but it is NOT because it's better. Furniture and case goods made from MDF will last about one tenth to one quarter as long as medium to well-made solid wood furniture and case goods. MDF manufacturing produces more toxic waste than solid woods, even with the better glues being adopted in California. The short life span of MDF furniture and case goods means that it ends up in land fills polluting in ever-increasing amounts, instead of reusing the furniture as has been done with well-made antiques for hundreds of years. The ONLY reason MDF is used is because it is cheap and the construction techniques used with MDF are simple to learn, so that less-experienced workers are needed. In my next blog, I will talk about the use of plywood in furniture. I want to start out by saying I am completely anti-MDF. MDF doesn't belong in furniture, kitchen cabinets, bath cabinets, architectural mouldings, or mill work, and definitely not in doors. Let me explain. MDF is inherently heavy, has little structure strength, falls apart if exposed to moisture, and any type of joinery doesn't come close to working. Specialty fasteners and screws are your only option and even with them, setting a box (cabinet) down too hard, or tying your ropes too tight on your delivery truck, and the fasteners crumble through the wood. To make my point, I have three experiments you can try. First test, take a 3/4" x 24" x 48" MDF panel, support both ends 4" off the ground, and step on it. It crumbles. Now do the same with a piece of solid white oak, 3/4" x 6" x 48", and jump on it. Nothing happens to the wood, it is solid as a rock. Second test, take a new piece of MDF and the same piece of white oak. (the white oak didn't break or crumble so you can use the same piece) Use some blue tape to make a reservoir or pool on each piece. Take 2" blue tape, stick about 1/2" of that piece to the wood, and stand the rest of it upright. Do this on all four sides until you have a little box, about 6" square. Pour in about 1/2 cup of water into the little pool, and leave it overnight. What happens? The MDF swells and crumbles, while nothing happens to the hardwood, except that it gets wet! 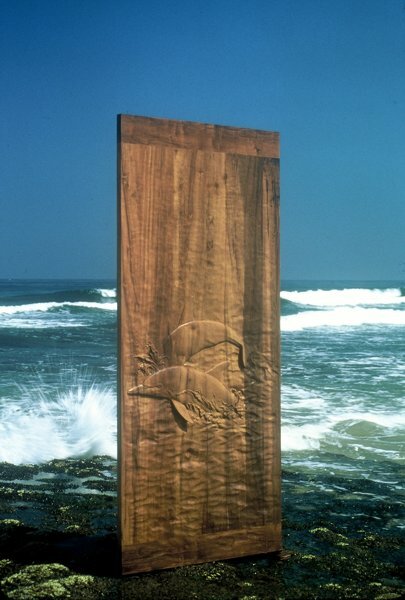 The piece shown here would not have survived the photo shoot had it been made from MDF. Third test, take two pieces of MDF and two pieces of solid white oak, 3/4" x 6" x 24". Screw the ends together , at the 6" width, forming a 90 degree corner using using three 2" dry wall grabber screws (use tapered drill/counter sink to pre-drill holes for screws). Now try to break the pieces apart. No effort is needed to break apart the MDF pieces. The solid white oak is all but impossible to break. My main point is, if you want to build fine furniture and cabinetry and doors, pieces that will last, do not use MDF. Solid wood is the only way to go in a quality woodshop. I will cover more details on this in my next post. Over the years many people, both professional and non-professional, have asked my advise on a variety of subjects. I feel I have a lot of experience and advice than many of you might be interested in, and might even benefit from, so I decided to start this blog. I have been working in fine woodworking for over 40 years, utilizing my skills in woodworking, as well as glass arts, metal forging, woodcarving, and bronze sculpture. You can see many of them in the gallery on my web site at http://www.davidfrisk.com I will be writing about various topics, including furniture and door construction, woodcarving, finishes and finishing techniques, working in cold and hot glass and different metals, along with advice such as where to find the best woodcarving tools and how to tell if a piece of furniture is well made. I will try to update this blog once a month, more often if I have the time. I run a full-time woodworking shop, so my free time is limited. I hope you enjoy reading my posts, because I am looking forward to writing them for you! And I would love to hear from you about any topics you may find interesting for me to write about.